Here, two emergent trends in tonic collide: first, the trend towards tonic syrups: concentrated, sweet, herbal concoctions designed to be diluted with soda water before drinking. The second trend is that of “companion” tonics: that is tonics made by distillers, crafted in such a way that it perfectly compliments the spirit. Pinckney Bend has designed a tonic to compliment their Pinckney Bend Gin. 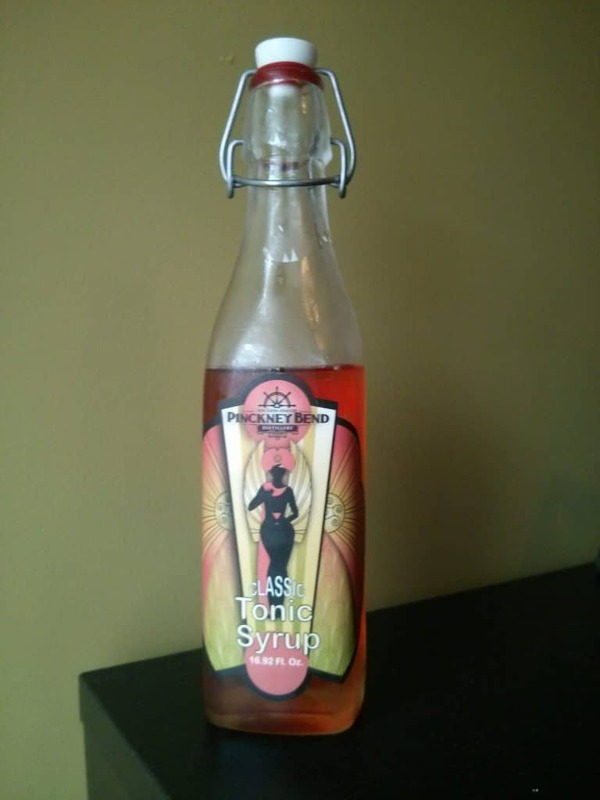 They are the only companion tonic syrup on the market right now, but others have pushed this idea forward in the past. Thoughts: most tonic syrup ratios advocate for 2 parts of their gin. This is a case where “companion” should be taken quite seriously to understand. Their gin is a little stronger than most [93 proof] and has a good deal of heat. For companion purposes, I think this ratio works. For other gins, I’d suggest perhaps looking a bit closer to the 3 parts soda, 2 parts gin, 1 part tonic, that most bottles lean towards. The color is amber with hints of peach and rose. Light, soft, and very viscous when swirled. The nose is cinchona, rose, and lemongrass, with hints of something earthier to ground it all. Quite sweet as well. On its own, the palate is very saccharine, very sweet. There’s a good deal of complexity in here too once you get past the sweetness. A little bit citrusy, hibiscus and orris root, notes of lavender and rose with a spicy bit on the finish redolent of juniper. This sweetness is greatly mellowed out when combined with soda water- to the point of it almost being quite subtle and understated [especially in a 4:1 soda water to syrup ratio]. Rose and lemongrass shine most brightly. Mixed with gin and soda water, you start to taste the way the tonic gently compliments the gin. For contrast I’m mixing it with Hat Trick Gin, another contemporary styled gin, but with a slightly different profile than the citrus forward Pinckney Bend. I wanted to see how does this syrup handles other gins as well. I mixed this cocktail up in a more standard 3:2:1 ratio as well. The nose is enhanced with some herbal and floral notes from the tonic syrup. Not a lot of your usual quinine of tonic aromas. This smells like it could almost be a really complex gin on its own. I can now taste why the ratio might be recommended the way it was. The flavors are subtle, much more subtle than perhaps first nose would indicate. I’d recommend listening and going 1:1, especially if it’s a gin with a loud perspective. Bringing it back to 1:1 restores things to harmony and order. And the floral/herbal notes add a nice, fresh, and not too overwhelmingly tonic-syrup nor tonic-like flavor to your G&T. Refreshing, still a bit citrusy in the back of the palate, but all in all- a nice tonic syrup that I recommend, and strongly recommend if you’ve got some of their gin on hand. Best consumed: w/ Pinckney Bend’s flagship gin, or another contemporary, overproof, slightly citrus forward style gin. Rating: I absolutely love the explosion of tonic syrup that are available right now. Though there’s a citrusy pucker to it, there’s a lot of floral and herbal complexity here. I’d say that the flavor profile reminds me of Fentiman’s profile when mixed well. I like it, and think that this work even outside of the companion gin concept, and would gladly recommend it as a more floral alternative to some of the more intensely spice-based syrups out right now.